A few weeks back I was in Savannah for a performance. I went for my usually Saturday run and explored parts of the city. The further I ran the more I started to notice that I was having trouble landing mid foot. It was frustrating. The more I thought about it, and the more I talked to other runners on dailymile and twitter the more I realized that my shoes were getting in the way. Don't get me wrong, I loved my Mizunos, but something just wasn't right. So, that weekend in Savannah I decided that I would finally try out a pair of Newton Running shoes. It never hurts to try. Fortunately there are a couple of stores in Atlanta that carry Newton Running Shoes (this sadly does not include my favorite Big Peach), so I was able to actually go to a store, get fitted, and actually try the shoes out before buying them. I couldn't believe how light they were! Seriously, I felt like I was bouncing around the parking lot as I was testing them out. 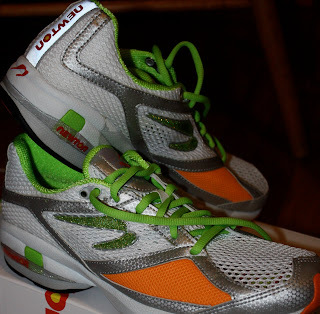 I could tell that they were much different than my Mizunos, and I knew that it meant paying much more attention to how I land when I run. After much debate about what size I needed I walked out with a pair of 10 1/2s. Normally I wear 10s, and the couple of times that I've worn 10 1/2s didn't go well (1st time I tripped over my own feet and busted my chin. 2nd time I had knee problems from the shoe's being too big). They assured me that Newtons run small and that it wouldn't be a problem. So, two days later I took them out for a test run and knew instantly that the 10 1/2s were a big problem. I felt like I was running on a slip-n-slide. While I was having an easy time of landing on mid-foot my feet were slipping all over the place inside the shoes no matter how tight I tied them. The store said that I could return them if I didn't like them, so I headed over the next day to see if I could exchange them for a pair of size 10s. They took them right back and handed me a pair of 10s no questions asked! Score! It's taken some adjusting, but I've been running in the Newtons for a couple of weeks now. For those who aren't familiar with Newton running shoes they have a lowered heel, and have more cushioning on the fore-foot (they call them "lugs") to promote a fore-foot strike. While I was looking at the shoes someone argued that they force your foot to land a certain way. Trust me, they don't "force" my foot to do anything. My foot can do whatever it wants, and does! I can certainly tell that I'm getting stronger each time I wear them. The more I wear them the more my pronation problems go away, but I have to slowly work them into longer runs. I think I wore them too much last week, and my knee started bothering me a little. go back and forth between the Newtons and my Mizunos is causing a little bit of a problem. Now I notice just how heavy my Mizunos are and how raised the heel is. It's driving me nuts, but I know I'm not ready to do all of my runs in the Newtons. I have a lot of respect for the Newtons. Are they the shoe for me? To be honest, I'm still not sure. I find them very interesting, and I can definitely tell that the switch to a shoe that lets me land on my fore-foot is helping! I like than they are low on my ankle, and that foot doesn't feel encased in the shoe. They breathe really well (I can see my feet through the mesh :)), and the toe box is wider than my Mizunos so there is plenty of room for my toes to spread a bit when I land. I have to be very focused when I run though. Do not assume that you will always land where you want when you run. If there is one thing I've learned from my violin playing that carries into running it's that you have to stay focused on what you want to accomplish in order for it to happen. Just tuning out is where things can go astray. I'm looking forward to running in them again this weekend (I took a little break this week). So far the first impression is favorable, although to truefully answer what I think about the Newtons is going to take more time, and more runs, which I'm looking forward to! This is very good info. I might have to look into Newtons when I start running again. Great post, I'm glad you gave our shoes a try. 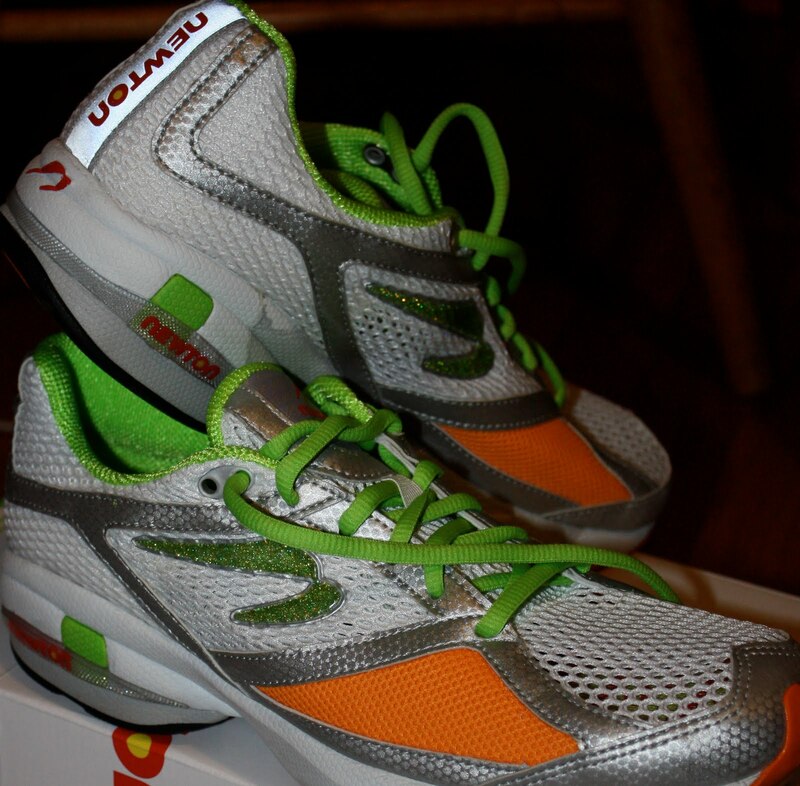 If you have any questions about the shoes me sure to email us at media@newtonrunning.com. After you have run in the shoes for longer you will have to think less and less about where you strike, but yes, it does take focus in the beginning.